Read his full speech below. It is very good. Climate change advisor Ross Garnaut has lambasted mining executives for destroying shareholders funds in the blind belief China's demand for Australia’s big three exports would continue to climb. While they had splurged on “wasteful overinvestment” China had been making good on its promise to cut its emissions intensity and had been sourcing iron ore from elsewhere. “It happens that the Chinese structural change has had its most severe effect precisely on the three commodities which have been at the centre of the Australian resources boom - iron ore, metallurgical coal and thermal coal,” he told a Melbourne Institute conference. Speaking at the same conference Treasurer Wayne Swan warned of a “savage blow” to the global recovery unless Republicans and Democrats in the United States could agree on a way to prevent a crisis in December when large numbers of tax cuts would automatically expire. Professor Garnaut said China had exceeded its ambitious emissions targets, cutting coal-fired generation by more than 7 per cent in the past year. A rapid expansion in hydroelectricity, and wind, biomass, solar and nuclear power had pushed down coal’s share of energy production from 85 to 73 per cent. Australia’s iron ore exporters would soon have to compete with massive new Chinese-funded mines in West Africa created in part by Australia’s decision to block Chinese investment at home. The forecasts for iron ore and coal exports in the government’s Asian Century white paper were barely believable, their credibility protected only by the presence of “low” projections along with so-called medium and high projections. Mr Swan built on his September attack on the “cranks and crazies” he said had taken over parts of the Republican Party saying the “looming fiscal cliff” in the United States could plunge it back into recession. The legislated unwinding of a decade’s worth of tax cuts and spending programs on December 31 would “left unattended, see the the US economy suffer a crushing annualised contraction of 2.9 per cent in the first half of next year”. “Whoever wins the presidential election in less than a week’s time and whoever controls the Congress will have choices to urgently make,“ Mr Swan said. Mr Swan will fly to Mexico for the G-20 finance ministers meeting on the weekend and then to Washington for meetings with the head of the International Monetary Fund Christine Lagarde and the head of the US Federal Reserve Ben Bernake. 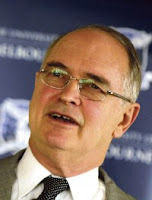 Professor Garnaut told the conference Australia had been blessed to have a mining boom immediately following the largest consumption and housing boom on record. The immediate challenge was to “come down from our hump in incomes and expenditure without precipitating recession”. "Some observers see Japan’s economic stagnation as a failure of the Japanese economy and polity. Many Japanese do not feel that their country is in crisis. Unemployment is low. Income is more equitably distributed than in the United States, although some Japanese are disturbed by increasing disparities. Health services are excellent by global standards and longevity incomparably high. Japanese enjoy high and subtle literacy and good education, and a rich cultural life. There is private financial and personal security and incomparable public security—natural disasters aside. To be sure, the ageing of the population slows national economic growth and reduces national strategic weight, and a more dynamic polity would remove some longstanding imperfections. But if Japan is the end point of modern economic growth, then modern economic growth is no bad thing."